Shoreditch street art commemorates where the tragic love story was first performed back in the 16th century. When it comes to checking out street art in Shoreditch, you’ll be spoiled for choice. However, one of the district’s most striking murals has a special historic significance. One particular building on New Inn Broadway features a mural depicting Romeo and Juliet… on the very spot where the play was first performed. Long before The Globe was built on Bankside, William Shakespeare (1564-1616) used to tread the boards in the East End. In 1572, the Mayor of London cracked down on plays being performed within the City of London in an attempt to prevent the spread of the Plague. As a result, theatre companies started performing just outside the jurisdictions of the City. The Theatre was built in 1576 on the site of the Holywell Priory, which has been demolished following the dissolution of the monasteries a few decades earlier. It was started by actor and theatre manager James Burbage (1530/5-1597) and his brother-in-law John Brayne (1541-1586). At the time, Shoreditch was notoriously rough and was surrounded by brothels, gambling dens and rowdy taverns. The Theatre was built in a polygonal shape, included three galleries and a yard and was said to have cost £700 to build. The Theatre owner Burbage was a member of the Lord Chamberlain’s Men theatre company, with a certain actor and playwright from Stratford-upon-Avon as one of his colleagues. The LCM was formed in 1594, when Shakespeare had already been making waves in the theatre scene for at least two years. The troupe started performing Shakespeare’s plays exclusively. Shakespeare’s tragic love story Romeo and Juliet was performed for the first time at The Theatre, estimated to have been written around 1591-1595. After 22 years of entertaining Londoners, The Theatre came to an end following a dispute between the late Burbage’s son Richard (1567-1619) and the site’s landowner Giles Allen. In a desperate bid to protect their playhouse, Richard and his brother Cuthbert enlisted the help of some associates to dismantle The Theatre in December 1598. The timbers were believed to have been hidden nearby in Bridewell, before being taken over London Bridge to Bankside when the weather improved. Timbers from The Theatre were used to build The Globe in 1599. For centuries, the site of The Theatre was lost until it was rediscovered by Museum of London archaeologists in 2008. They found remains of brick and stone polygonal footings of the gallery, along with seeds and fruit pips and broken beer vessels from the Elizabethan period. Just north of the Romeo and Juliet mural we see today, a building is being erected to house offices and a permanent exhibition about The Theatre. Today, a Romeo and Juliet mural adorns a modern three-storey office building on the site of The Theatre. The top of the piece features the heroine Juliet in a blue gown, looking down from her balcony for her Romeo, who gazes up adoringly at her from two storeys down. One of Juliet’s passages from Act 2, Scene 2 of the play is featured: ‘My bounty is as boundless as the sea’; ‘My love as deep the more I give to thee’; and ‘The more I have for both are infinite’. Fans of the play will recognise it from Romeo and Juliet’s post-Capulet ball discussion when they make plans to marry after meeting that evening. The mural was commissioned through the Global Street Art Agency in June 2018. New Inn Broadway, Shoreditch, EC2A 3PZ. Nearest station: Shoreditch High Street or Old Street. For more London history and architecture posts, click here. Find out about Middle Temple Hall, location of the first performance of Twelfth Night. The history of the Cecil Brewer staircase and Heal’s flagship store at Tottenham Court Road. London is full of some pretty spectacular staircases, many hidden from view from the general public. In my opinion, one of the capital’s most lovely ones is located in Heal’s furniture store in Tottenham Court Road. Heal’s has a long history on Tottenham Court Road, having had a store on the street for over 200 years. Heal’s was originally founded by John Harris Heal (1772-1833), a feather dresser from the west country. He opened his first store in Rathbone Place in 1810, before relocating to 203 Tottenham Court Road in 1818. The store soon won over Londoners with its feather mattresses, which were significantly more comfortable than the typical straw palliasses that many were sleeping on at the time. When John died in 1833, his widow Fanny (1782-1859) and their son John Harris Heal Jnr (1810-1876) took over the business and renamed it Fanny Heal & Son. In 1840, they moved the premises to the current site at 192 Tottenham Court Road with a new purpose-built store. The new building was designed in a Venetian Palazzo style by architect James Morant Lockyer (1824-1865) and was completed in 1854. Now incorporating No.s 186-198, it became known as one of the largest stores in the capital. By 1916, Heal’s was under management by John Jnr’s son Sir Ambrose Heal (1872-1959), who had joined the family business in 1893 after completing an apprenticeship as a cabinet maker. He wanted to modernise the business for the 20th century and enlisted his cousin and best friend Cecil Brewer (1871-1918) and business partner Arnold Dunbar Smith (1886-1933) to design a new store. The original building was demolished to make way for the new store, which was was built between 1914-1917. Brewer erected his namesake spiral staircase at the back of the store in 1916, ready to take visitors upstairs to the new Mansard Gallery. The helix of lights tumbling from the ceiling were added after World War II. The concrete and wooden staircase was refurbished in 2013 and a Bocci chandelier was added, completing its picture-perfect look. Although Heal’s hasn’t been a family business since 1983, it’s still trading in furniture and homewares on Tottenham Court Road over two centuries later. The store was Grade-II listed in 1974 and it’s magnificent staircase is still used by customers to access different departments. Heal’s, 196 Tottenham Court Road, Fitzrovia, W1T 7LQ. Nearest stations: Goodge Street, Warren Street or Tottenham Court Road. For more London architecture posts, click here. The Daily Telegraph may have moved on, but its imposing offices remain. The newspapers have long moved out of Fleet Street, but their buildings remain. Standing halfway along the iconic street is an art deco temple to journalism. Peterborough Court is the former home of the Daily Telegraph. Although the publication has moved on to Victoria, there are still subtle signs of the building’s former use on the façade. The Daily Telegraph was founded in 1855 and its first offices were in the Strand, before it moved to 135 Fleet Street in 1862. In 1882, the Prince of Wales (King Edward VII – 1841-1910) opened the Telegraph’s new offices made of Portland stone and Aberdeen granite, designed by architects Arding, Bond and Buzzard. The building remained until the twenties when it was torn down to make way for the current design. Peterborough Court was built in 1927-1928 to a design by architects Elcock and Sutcliffe, with Thomas Tait (1882-1954) and Sir Owen Williams (1890-1969) as consulting engineers. Tait worked on Adelaide House (the City’s tallest office block in 1925), later phases of the Selfridges department store on Oxford Street and the pylons of Sydney Harbour Bridge. Meanwhile, Williams was the head engineer for the original Wembley Stadium (1923-2003) and architect of The Dorchester. The building was named Peterborough Court after the Bishop of Peterborough, who used to have a house on Fleet Street. The name inspired the ‘Peterborough’ diary column in the newspaper, which remained for decades until it was renamed in 2003. What is the London Stone and why is it famous? Many of us have heard the urban myth about the ravens at the Tower of London, claiming the Crown and Britain ‘will fall’ if they leave. However, there’s another old legend tying the capital’s success to a piece of stone. The London Stone has been a part of the city’s history for centuries, yet so many Londoners haven’t even heard of it. Today, the London Stone stands on bustling Cannon Street, protected from the elements in a display in the wall of a modern office building. The block of oolitic limestone measures 53m x 43cm x 30cm, although was originally much bigger. The London Stone was first recorded in 1100, although its origins are believed to date back much earlier. Some historians believe the stone has been in situ since the Romans occupied London, perhaps being related to the local governor’s palace, which stood on the current site of Cannon Street railway station. It’s also been claimed that King Arthur pulled his sword Excalibur from it. The London Stone in its Georgian plinth on the wall of St Swithin’s Church in 1831. In Medieval London, it stood on the south side of Candelwrichstrete (Candlewright Street), which was widened to create Cannon Street in the 17th century. It was a popular landmark and listed on many maps of the area. A French visitor to London in 1578 described the Stone as having much larger dimensions of 90cm x 60cm x 30cm. London historian John Stow wrote in 1598 of “a great stone called London stone” adding it was “pitched upright… fixed in the ground verie deep, fastned with bars of iron”. The Stone is even mentioned in William Shakespeare‘s Henry IV, Part II in the 1590s. The scene refers to Jack Cade, leader of the Kentish rebellion in 1450, striking the London Stone with his sword and declaring himself Lord Mayor of London. Although the reason for the Stone’s reduction in size is not known, it’s highly likely it was damaged during the Great Fire of London in 1666. By 1742, the Stone was considered an obstruction to traffic so was moved to the north side of Cannon Street, beside the door to the Church of St Swithun, London Stone. Fifty-six years later, it was moved again when it was built into the south wall of the Church. It was during the 18th century that it was claimed the success of London depended on the stone’s survival. Georgian writers claimed there was an ‘old saying’ referring to the London Stone’s other name as ‘the Stone of Brutus’. It read: “So long as the Stone of Brutus is safe, so long will London flourish.” In the 1820s, it was relocated a third time when it was set on its own plinth in the middle of the church wall. It was later covered by a protective iron grille at the request of the London and Middlesex Archaeological Society in 1869. Standing on London Wall surrounded by the brutalist concrete of the Barbican estate and 21st century office blocks is a rare piece of Medieval London. Largely hidden in recent decades, the redesign of the highwalk and a new pavement-level garden means Londoners can now see the ruins of St Alphage church. The original St Alphage (or St Alphege) Church was built slightly north of the current site around the 11th century and adjoined the London Wall. The second church was originally the Priory Church of the St Mary-within-Cripplegate nunnery, which was believed to have been founded before 1000, but had fallen into decay by 1329. While the original church was demolished during the Dissolution of the Monasteries in the 1530s under Henry VIII, the Priory Church survived and took on the name St Alphage. It was repaired in 1624, with its steeple rebuilt in 1649. St Alphage was slightly damaged during the Great Fire of London in 1666 and be 1747, the steeple was in such bad condition, the bells couldn’t be rung so four were sold. In 1774, the church was declared unfit for use and was rebuilt at a cost of £1,350, with the tower retained. The new church opened in July 1777. By the turn of the 20th century, the tower and porch were in poor condition, with the north entrance rebuilt with a neo-Gothic façade by 1913. It was damaged during World War I and repaired in 1919. However, the same year, the church’s fate was sealed for good. The bells went to St Peter’s Church in Acton, west London, with the nave being demolished in 1923. During World War II, the tower was maintained as a base for prayer, although was gutted by a fire in 1940. As the City of London Corporation started to redevelop the ravaged City during the 1950s, the church’s porch and upper levels of the tower were moved. What remained (and what you see today) were Grade II listed in January 1950. The current structure features a central tower made of flint and rubble and arches on the north, west and east sides. When the London Wall road and the Barbican Centre were constructed in the 1950s, pedestrian access to the ruined church was cut off, while an ugly concrete highwalk didn’t give much of a view of the remains. In recent years, the highwalk has been redeveloped and some of the 1960s office blocks demolished to make way for more modern 21st century buildings. The new highwalk, unveiled in 2018, is more delicate and gives a great overview of the ruins. Meanwhile, pedestrians can access the remains of St Alphage at street level via a small garden, featuring greenery and concrete block seating. St Alphage Garden, City of London, EC2Y. Nearest station: Barbican. Did you know there’s a piece of the Berlin Wall in London? This year marks 30 years since the fall of the Berlin Wall. From 1961 to 1989, a guarded concrete barrier divided West and East Berlin. During its 28 year life span, over 80 people died trying to cross the wall. Finally, on 9 November 1989 the wall started to come down and was destroyed by Berliners, uniting the city once again. I was at primary school when the wall fell and remember my impassioned teacher telling us about this historic moment during assembly, which I was a bit too young to understand. Various pieces of the Berlin Wall survive today. In the gardens of the Imperial War Museum in London, there is a piece of the wall complete with original street art. It features the words ‘Change Your Life’ in a giant mouth by graffiti artist Indiana (Jurgen Grosse). The 3.64 metre high section comes from near the Leuschnerdamm in the Kreuzberg district and was acquired by the Imperial War Museum in 1991. It is believed the slogan ‘Change Your Life’ may be from the German poem Archaischer Torso Apollos (Torso of an Archaic Apollo). Imperial War Museum, Lambeth Road, Lambeth, SE1 6HZ. Nearest station: Lambeth North. Demon Barbers and Scottish newspapers. Fleet Street is synonymous with Britain’s journalism industry, with most of the country’s newspapers having offices or headquarters in the area in the first half of the 20th century. While most of the papers have moved on to less central areas, such as Canary Wharf, Southwark and Kensington, there still lies some signs of their EC4 past in the heart of the City. Standing at 186 Fleet Street is an old remainder of Fleet Street‘s tabloid heyday. No.186, along with 184 and 185 belong to DC Thomson – a Scottish publishing house and TV company. The Thomson family originally started out in shipping before branching out in publishing by buying the Dundee Courier and The Daily Argus in 1886. David Coupar Thomson (1861-1954) established DC Thomson in 1905 as the family’s publishing assets expanded. Although DC Thomson were headquartered in Scotland, they established a London base to cover relevant stories. Prior to the current building, the site featured the street’s last early 17th century timber-framed buildings before they were demolished. No.186 was built around 1913 by Meakin, Archer and Stoneham. The architecture practice had an office in Nicholas Lane near Monument and also designed The Strand Cinema Theatre in 1910 (it closed in 1953 and although the façade remains at No.428 The Strand, the auditorium has been demolished). The practice changed in 1916 with Edgar Percy Archer and Frederic Martyn Stoneham remaining in partnership together after Meakin left. The façade of the building features glazed red bricks with stone dressings. Five of DC Thomson’s titles were written across the building in mosaic bands as a form of advertising. Four of the five titles are still in publication, with The People’s Journal having folded in 1986 after a 128 history. The remaining publications are Dundee Courier (founded 1801); Dundee Evening Telegraph (founded 1877); Sunday Post (founded 1914) and People’s Friend (founded 1869). In 2014, DC Thomson extensively renovated their London and Dundee offices. However, just two years later, DC Thomson took the decision to close their editorial office, which meant the last journalists to work on Fleet Street were leaving. DC Thomson continues to own the building, with advertising staff remaining on site. As well being the home to the last Fleet Street journalists, 186 Fleet Street is also where fictional murderer Sweeney Todd’s infamous barber shop was located. The Victorian villain was known to dispatch his victims into the cellar from his barber’s chair and slit their throats with his razor. His sidekick Mrs Lovett then baked their remains in meat pies. 186 Fleet Street, City of London, EC4A 2HS. Nearest station: Chancery Lane. Standing in the courtyard of the Royal Academy of Arts this winter is a piece of Hollywood horror. Transitional Object (PsychoBarn) is an architectural installation by English artist Cornelia Parker. The 30ft high structure is inspired by the Bates Motel in Alfred Hitchcock’s 1960 classic Psycho. The house in the movie, where Norman Bates lived with his mother Norma, was modelled on Edward Hopper’s 1925 painting, the House By The Railroad. Parker’s scaled-down structure was first exhibited on the roof of New York City’s Metropolitan Museum of Art in 2016. It was erected in London in September 2018 and will remain in situ until March 2019. Transitional Object is not a real building, but a façade. While it looks like a traditional, all-American red barn, the dark windows, distressed paintwork and little signs of ‘life’ give it a creepy vibe – much like the house in the film. Transitional Object (PsychoBarn), The Annenberg Courtyard, Burlington House, Royal Academy of Arts, 49-50 Piccadilly, Mayfair, W1J 9ER. Nearest station: Green Park or Bond Street. Will remain in place until March 2019. Open Sat-Thu 10am–6pm, Fri 10am–10pm. Free to view. For more information, visit the Royal Academy Of Arts website. The river runs through it: Have you spotted the river in Sloane Square tube station? One of London’s hidden rivers is flowing through one of the capital’s busy tube stations. London is home to many ‘hidden’ rivers. Many of these became subterranean in the 19th century as the capital’s population boomed. A host of tributaries of the River Thames and River Lea have been forced underground and now exist in pipes. While most of the secret rivers aren’t visible to most Londoners today, there is one river you can see (sort of). The River Westbourne was originally named Kilburn – originating from ‘Cye Bourne’, which means ‘royal stream’. It rises in the Whitestone Pond in Hampstead and flows south through Kilburn, Bayswater, Hyde Park and Chelsea, before discharging in the River Thames near Chelsea Bridge. One of the crossings over the Westbourne was the Knights’ Bridge, a name dating back to at least the 11th century. Although the bridge is long gone, its name lives on in the district of Knightsbridge. There was another bridge crossing the Westbourne in the Sloane Square area named Blandel Bridge, later being renamed as Grosvenor Bridge. The Serpentine lake in Hyde Park was formed in 1730 when King George II’s wife Queen Caroline (1683-1737) ordered the damning of the Westbourne. The river continued to supply the Serpentine until 1834, when it was deemed too polluted, so Thames water was used instead. London’s population boom in the 19th century prompted widespread development. Increased residential dwellings popping up in the areas surrounding the Westbourne in Paddington, Chelsea and Belgravia, led to the decision to drive the Westbourne underground. The water was directed into pipes in the early part of the 19th century. Today, commuters who use Sloane Square tube station can see the River Westbourne crossing the platform and tracks in a pipe. A large iron pipe suspended from girders carries the Westbourne through Sloane Square station, which was opened in December 1868. The pipe is the original one from the 19th century and managed to escape damage when the station was bombed during World War II in November 1940. Sloane Square tube station, Chelsea, SW1W 8BB. Nearest station: Sloane Square (obviously!). For more London history posts, click here. Today, the London district of Chelsea is famous for its football club, trust fund socialites and designer boutiques. However, until the 19th century, the area was a rural neighbourhood. Chelsea served as a market garden for the rapidly-expanding city, with corn, barley, fruit and vegetables grown on the area’s numerous farms, orchards and gardens. It was particularly known for its root vegetables and was the first place in Britain where lettuce was grown successfully in the mid-to-late 18th century. Meanwhile, the area became fashionable for the wealthy from the 16th and 17th centuries, with its residential districts starting to overtake the farms in the late 19th century. One such farm which held on longer than others was Wright’s Dairy. The dairy was one of the first in Chelsea and was erected on Cook’s Grounds (the site of Glebe’s Place today) in 1796. Around 50 cows and two goats grazed nearby, providing milk for the dairy. In advertorials for their business, they were described as ‘dairy farmers and cowkeepers’. A frequent visitor to the dairy was Scottish philosopher and writer Thomas Carylyle (1795-1881), who lived a few minutes walk away on Cheyne Row. 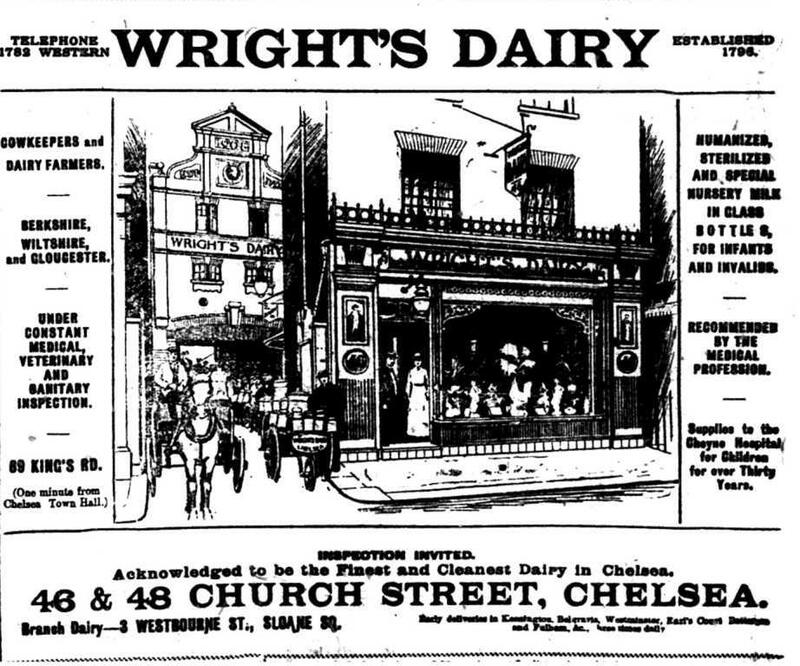 At the time of Carylyle lived in Chelsea, the dairy was run by W. H. Wright, whose late father had founded the business.